The Optio E50 features face recognition technology (Auto Focus and Auto Exposure), digital shake reduction, auto picture mode, panorama mode, 16 frames of continuous shooting and a ‘green mode’ which is especially for beginner users. It also has 9.5 megabytes of internal memory. Featuring 8.1 effective megapixels, the Optio E50 features a new image processing engine with increased processing performance and a high-performance PENTAX lens. The Optio E50 features a 3X optical zoom lens with a focal range covering angles of view equivalent to those of a 37.5-112.5mm lens in 35mm format, which is ideal for a broad spectrum of subjects from landscapes to portraits. 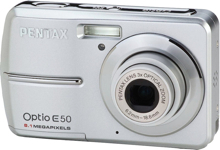 Combined with a 4X digital zoom, the Optio E50 achieves a total of about 12X zoom capability. The Optio E50 is equipped with Face Recognition Auto Focus and Auto Exposure function* for easy, high quality portraits. This convenient function automatically detects faces, adjusts focus, and sets the optimum exposure regardless of where subjects appear the screen. A maximum of 10 people may be recognized at once and the faces are highlighted even in settings with backlighting. *Available when the photography mode is "Auto Picture", "Program", "Portrait", and "Kids" and camera is directed to the people from the front. Designed to reduce camera shake and subject blur when photographing still images, this mode adjusts sensitivity automatically to as high as ISO 1600 to match the brightness of the subject. This allows photography with fast shutter speeds and images with less blur. With the Auto Picture mode, the Optio E50 will automatically determine the optimum settings for various shooting conditions and subjects such as Landscape, Portrait, Night Scene, and Normal modes. This PENTAX original function makes photography easier for newer users as it eliminates the need for individual settings. The Optio E50 also features a Green mode to automate camera setup especially for digital camera beginners. Press the Green mode button to automatically set exposure, sensitivity, white balance, and other parameters according to the shooting conditions. This function is useful when users allow others to take a picture or when users lose track of camera settings. Powered with AA batteries, the Optio E50 makes a perfect travel camera. Battery life has been improved to allow up to 250 photographs* per set of alkaline batteries. *Based on measurement conditions conforming to CIPA specifications.